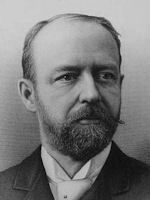 Francis Blake (1850-1913) worked initially for the US Coastal Survey. Following marriage into a wealthy family he was able to devote all his time to invention. 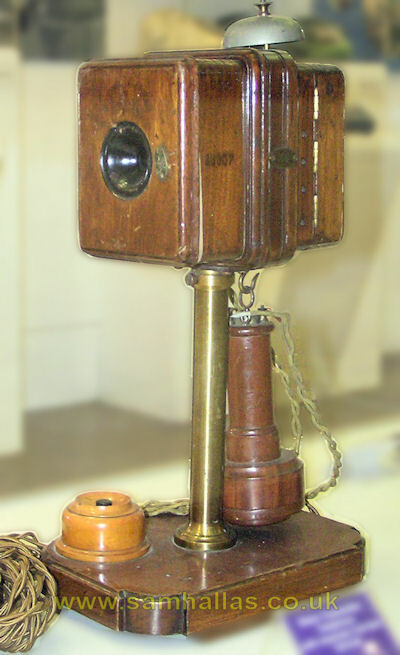 He submitted his design for an improved carbon transmitter to the Bell Company who had been desperately trying to devise one that improved on the Edison design. Initially the Blake design was difficult to keep in adjustment for optimal performance. After some modifications by Bell employees Edmond Wilson and Emile Berliner the Blake transmitter performed to their satisfaction. The main frame is of wood cut out in the centre to form a mouthpiece. Behind this is an iron diaphragm held in an India rubber ring for insulation and to damp any vibrations. 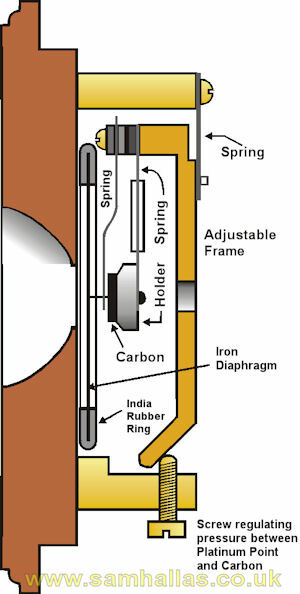 A platinum contact is supported on a thin spring between the diaphragm and a block of carbon, which is mounted on metal supported on a second spring. 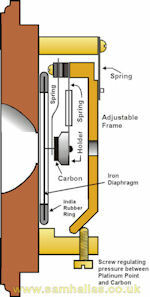 The whole spring and contact assembly is attached to a spring mounted frame which can be adjusted by a screw. Vibrations of the diaphragm are passed to the platinum contact causing a varying pressure on the carbon block. In turn this varies the resistance between the contact and block causing a varying current to flow in the external circuit. In Britain the Blake was used for many years by the National Telephone Company. In the following part we shall move on the next phase of development in carbon microphones – the granular transmitter. Berliner & Blake, Linley Wilson, Australian Historic Telephone Society Newsletter, October 2005, reproduced at Bob's old phones essay on Blake transmitter. Fig 1 is redrawn SMH from diagram in Herbert & Procter.